Hi, I thought you Gibson amp fans might like some vintage stuff. Now, THAT'S what I call a Man-Cave! I too could not help but notice the es-175 in the glass wall case too. OH yea! Sweet! Great collection of some of Gibson's earliest amps! It is a 1966 ES175D I have had for many years. The display case came up at a store clearance and fitted it perfectly. I've posted this photo in the past, but they are of the correct time period as your ES175D. 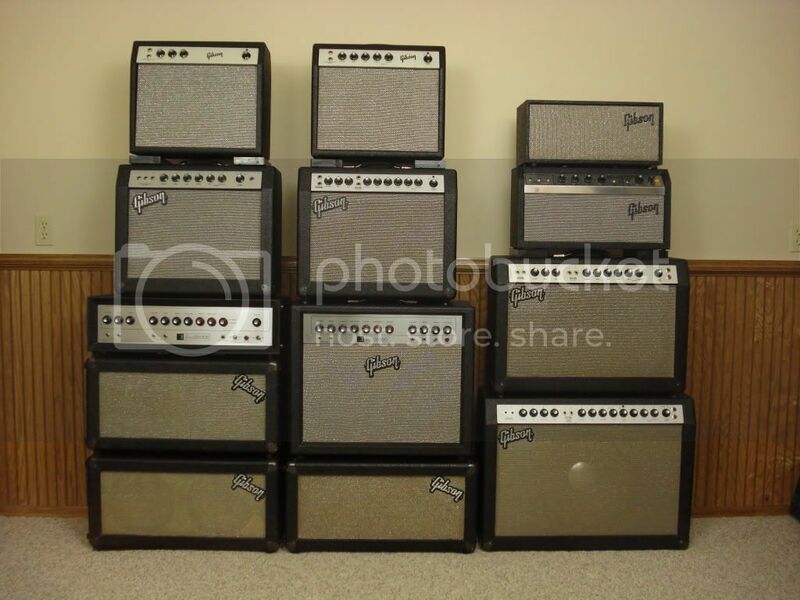 To keep my collection of amps from getting too out of hand, I narrowed it down to these several years. Do you trade Grog? I have been searching for a year for a vintage 36 37 or 38 EH150 here in the UK but there are just none around. I have a 36 ES150 and want to marry it up with the original amp.